Interstellar tsunamis can act as a defibrillator for “red and dead” galaxies, astronomers have discovered. When neighboring clusters of galaxies merge it causes a shock wave and new generations of stars emerge in resurrected cosmic systems. Comatose galaxies, that stopped star formations in the distant past but still interact with their cluster neighbors, have a chance to revive, show papers by a team of astronomers, led by Andra Stroe of Leiden Observatory and David Sobral of Leiden and the University of Lisbon. They were recently published in the journal Monthly Notices of the Royal Astronomical Society. Scientists usually compare cosmic clusters, comprised by thousands of galaxies, with urban-like structures in infinite space. Over the course of billions of years, these structures merge or collide, releasing huge amounts of energy. 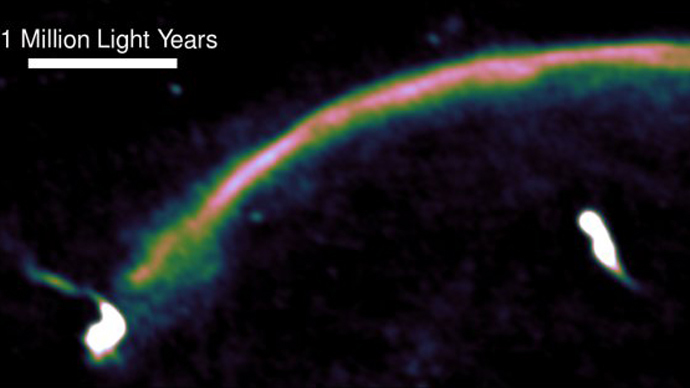 The resulting so-called cosmic tsunami travels through a cluster, and boosts those galaxies that have little energy on their own. "Much like a teaspoon stirring a mug of coffee, the shocks lead to turbulence in the galactic gas. These then trigger an avalanche-like collapse, which eventually leads to the formation of very dense, cold gas clouds, which are vital for the formation of new stars", said Stroe in the press release. The astronomers studied the merging galaxy cluster CIZA J2242.8+5301, dubbed the “Sausage”. It is located 2.3 billion light years away in the direction of the constellation of Lacerta, which lies on the northern celestial sphere. They used the Isaac Newton and William Herschel Telescopes on La Palma, and the Subaru, CFHT and Keck Telescopes on Hawaii. "But star formation at this rate leads to a lot of massive, short-lived stars coming into being, which explode as supernovae a few million years later,” David Sobral said. “The explosions drive huge amounts of gas out of the galaxies and with most of the rest consumed in star formation, the galaxies soon run out of fuel. If you wait long enough, the cluster mergers make the galaxies even more red and dead – they slip back into a coma and have little prospect of a second resurrection." As the merger triggered star production is quite brief in astronomical terms, the astronomers were quite lucky to spot the shock evolution of the galaxy. Now, they are aiming to find out if the Sausage cluster is unique, as well as what conditions are essential for such a phenomenon to happen.